We are a community of Catholic Sisters. We are members of the international Order of Preachers that was founded by St. Dominic in the 13th century. We have dedicated our lives to preaching the Good News of truth, love and justice. Throughout our congregation’s history of more than 165 years, we have responded with compassion and commitment to the critical issues of the times. We are committed to an ever-deepening relationship with God, the source of our faith, hope, and love. We study the Gospel as the inspiration and example of the life we aspire to live, as Jesus taught us. We share the joys of the Dominican apostolic life, and draw on the strength and encouragement of one another to meet its challenges. The examples of St. Dominic and St. Catherine of Siena are our guides to life as Dominicans. Prouilhe, a village in the south of France, is often called “the cradle of the Dominican Order” because it was the site of the very first Dominican house, a convent founded in 1206. Dominic and his followers were given a neglected, crumbling church that became a refuge for women who had been converted to Catholicism. This location became the monastery of the “holy preaching” formed by Dominic and the first women who joined him. It was a community in which contemplation of God and love of neighbor became integrated. Who was Dominic and what led him to found a new order of women and men? What did he stand for that still resonates with us today, 800 years later? His love of study and acts of charity came to the attention of the local Bishop Martin of Osma who invited Dominic to join the Cathedral canons (priests who served the population of Osma). The canons shared prayer, study, and a common life according to the Rule of St Augustine. In 1203 Dominic was asked to accompany his mentor and friend, Bishop Diego, who succeeded Bishop Martin, on a diplomatic mission for the King. As they traveled through southern France, the two men were disturbed by what they saw: tribal groups pillaging small villages, land stolen from those without armies to protect themselves, crushing poverty, a laity disillusioned by the scandalous lifestyle of poorly educated clergy, and a local Church without sound preaching. On one trip traveling through Toulouse in France, Dominic and his party spent the night at an inn. The host believed a heresy common to the time and place, and Dominic spent the night in deep discussion with him. By morning he had convinced the man of his error. Perhaps Dominic had an inkling then of his vocation call to an active life of teaching and conversion. From the roots of Prouilhe a new religious order evolved. Dominic sought to combine the education found in the older monastic orders with a structure focused on turning within and then reaching out. The routine of each day included contemplative prayer, the fruits of which would be freely shared with all those one met. Dominicans would be preachers, trained to use the languages the people spoke. The Order of Preachers was approved in December 1216 by Pope Honorius III. Dominic died in 1221 and was named a saint of the Church in 1234. Today the Order of Preachers has members worldwide, engaged in a variety of ministries. Sisters, friars, nuns, and lay Dominicans follow the example of St. Dominic, preaching the gospel of love, truth and justice by word and deed. 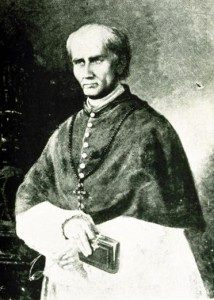 In late summer of 1850, Joseph Sadoc Alemany, a Dominican Friar and the newly named Bishop of California, traveled to Europe. He was on a mission to invite religious women to travel to a very wild and uncivilized part of the new world, and offer a Catholic education for the young. California was not yet a state, and the Gold Rush was in full swing. One of the bishop’s first trips was to The Monastery of the Cross in Paris. There he met Sister Mary of the Cross Goemaere, a Belgian novice. She volunteered to accompany him and another Dominican, Francis Sadoc Vilarrasa, and on December 6, 1850 the trio landed in San Francisco. In spring 1851, Sister Mary settled in Monterey, became prioress of the first group of women religious in the new state, and opened a Catholic school for girls, Santa Catalina, with the financial help of local residents and the bishop of California. Within three years, nine women, three American, one Mexican, and five Spanish, had joined Mother Mary to form the Congregation of the Most Holy Name of Jesus. In 1854, the sisters moved from Monterey to Benicia because it seemed to offer a more promising future for a school than Monterey and because Alemany’s newly divided diocese no longer included Monterey. The school and convent were named St. Catherine’s Academy. Mother Mary continued to guide the sisters and to instill in them a sense of Dominican life and apostolate. Her last act as prioress was to open a convent and school in San Francisco in 1862. This school, St. Rose Academy, became a San Francisco institution, and lasted until extensive damage from the 1989 Loma-Prieta earthquake forced its closure. With the original focus on Catholic education, the Sisters founded, administered and taught in elementary and secondary schools in California and Nevada for a century and a half. 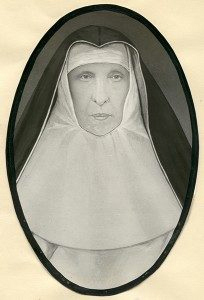 Under the forty-two years of leadership of Mother Louis O’Donnell (1887-1929), the Sisters also entered the health care field. St. Joseph’s Home and Hospital in Stockton, California became their ministry in 1899, and St. Mary’s Hospital in Reno, Nevada in 1912. With tremendous faith, generous donations, and pledges of financial support, in 1889 Mother Louis arranged for the construction of a new Victorian-Renaissance style building which became Dominican College of San Rafael. The College in the beautiful Magnolia Valley included the convent, novitiate, and the Upper and Lower schools for girls. 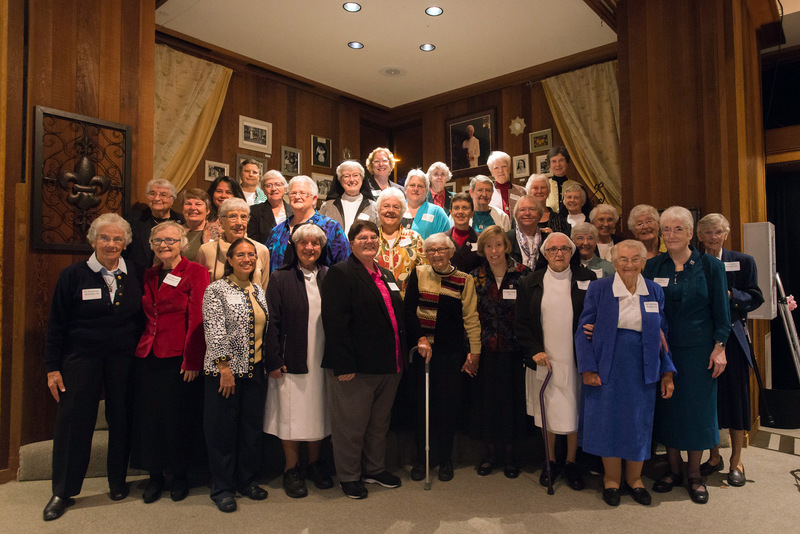 Although some sisters remained at St. Catherine’s in Benicia, they tearfully bid good-bye to the entire novitiate and several professed sisters who set out by schooner to begin ministry and community life together in San Rafael. In 1965 the elementary and secondary schools were relocated in nearby San Anselmo and the new school was named San Domenico. The four story Victorian motherhouse was destroyed by fire in 1990. Today Dominican University of California continues to operate as an independent, co-educational, liberal arts university with both undergraduate and graduate programs. Our sisters still serve on the faculty and Board of Trustees. Historically Catholic sisters, including the Dominican Sisters of San Rafael, arrived in the United States to establish schools and hospitals. In the spirit of renewal springing from Vatican II, congregations were encouraged to revisit their missions, and expand their ideas of where and how they could best be of service to God’s people. Today we can be found not only in schools and hospitals, but also in parishes, social service agencies, day programs for those without homes, and prisons. We minister as spiritual directors, chaplains, retreat leaders, artists, physical therapists, professors, peace and justice promoters, and tutors. We go where God leads us. Mission Statement: We, the Dominican Sisters of San Rafael, commit ourselves to the mission of Dominic: to proclaim God’s Word in our world.